Bernini Honolulu offers authentic contemporary Italian cuisine that is influenced by Chef Kengo Matsumoto’s philosophy to, “draw out the natural and best tasting flavors from his ingredients.” He and his staff can be found at the local markets daily to explore and handpick only the finest of ingredients and the freshest locally grown produce. The kitchen expertly brings these elements together to provide you with a variety of savory dishes that will tickle your taste buds and seduce your appetite. Visitors and locals alike will be able to experience the flavors of Bernini Honolulu, which is conveniently located next to Ala Moana Center. We are on Facebook now. Please Click Here to view our Updates. 14 years ago, Chef Matsumoto opened his first restaurant "Bernini" in Azabu Juban, Tokyo after his culinary training in Northern Italy. 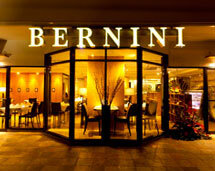 Bernini is renowned for its authentic Italian cuisine and attracting the likes of the famous from all over Japan. Following the success of Bernini, he opened two more accomplished eateries in Ginza. "Vinoteca Wagon," a modern Italian wine bar & restaurant and"Pizzeria Romana Bernini," which offers a variety of freshly baked Roman-style pizza. In April 2011 Chef Matsumoto debuted his first restaurant in Hawaii, “Bernini Honolulu” with co-owner and partner, Motoyo Koyata.